A sofa fitted with a sleeper mattress allows you to convert your living room to a guest bedroom in minutes. Invite guests to sleep in your home instead of making other arrangements allowing family holidays or reunions with friends to be more fun. Easy-to-use, a sofa with a sleeper mattress brings your home more function without taking up additional space. As you sit for hours, cushions can start to be worn in. With fully upholstered seat cushions you can rotate them any which way to make sure the best side if always facing up. 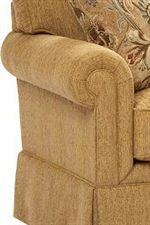 Keep cushions fresh and looking great with the ability to rotate them any way because they are fully upholstered. Comfortable doesn’t have to look sloppy. 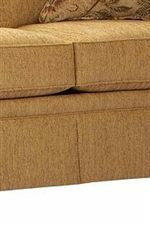 Seat back cushions are fitted with multiple compartments to allow for fiber to be evenly distributed as well as stay in one place helping to eliminate the need for constant rearrangement of pillows. Interlocking wood forges a sturdy frame that can withstand the heavy use it will receive from being in an important room in your home. Quality construction and long lasting cushions come together in these pieces, giving you the durability you need in your home. Like the technology in a pillow top mattress, Duracoil cushions have individually wrapped coils in between layers of soy-base foam. This technology enhances the seat of your upholstery by creating a place where you can sit for hours comfortably giving you the resiliency you need. Create a warm and sophisticated style in your living room with this elegant sleeper sofa. The plush high back cushions and deep welted box seat cushions will keep you cozy, framed by pretty rolled arms with pleated detailing. A smooth and simple skirted base completes the prim and proper style. The inner sleeper mattress easily pulls out, accommodating over night guests. The Audrey Traditional Queen Sleeper Sofa by Broyhill Furniture at AHFA in the area. Product availability may vary. Contact us for the most current availability on this product. Fabric Options This collection is available in a variety of upholstery choices. Leg or Skirt Full tailored skirt. Frame Construction In selecting materials, designers and engineers design products that use a combination of selected hardwood and softwood solids, selected hardwood and softwood veneers, and wood and/or simulated wood products. Seat Support Specially designed spring units are used. Wood accent chairs feature a latex webbing suspension system. All other styles utilize steel sinuous wire springs or steel coil springs. No-sag springs are made from 60% recycled steel, requiring fewer raw materials. Warranty 5 year warranty on wood frame and parts and spring systems, 3 year warranty on cushions, sleeper mechanisms, and power recline components. 1 year warranty on fabrics and leathers. A traditional beauty with up-to-date comfort features. Audrey invites you to sink into its thickly padded seat and back cushions, while you delight in its kick pleat skirts and rolled armrests. Design features include welted cushions and trim. Audrey throws in a few contrasting toss pillows. The Audrey collection is a great option if you are looking for Traditional furniture in the area. Browse other items in the Audrey collection from AHFA in the area.